Mexican World Cup fans were able to get a double dose of World Cup action from Televisa this year. 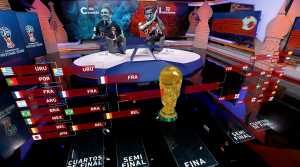 While Televisa had rights to the World Cup and used those rights to bring in new technology such as Viz Libero AR, sister network TDN (Televisa Deportes Networks) created a massive World Cup spectacle in their studio to give soccer fans around-the-clock news. TDN implemented Vizrt AR graphics in their studio shows. One of the biggest in TDN’s World Cup coverage was how they leveraged augmented reality (AR) as the tool for the narrative of each story. TDN’s World Cup studio featured multiple video walls throughout the studio displaying content rendered by a Viz Engine real-time 3D graphics engine, along with Russia-themed set pieces. Tracking for the AR graphics was provided by stYpe Red Spy which sent tracking data to Viz Virtual Studio and Viz Engine to render the final composited output in real-time. To give presenters tactical analysis capabilities, TDN created a touchscreen controller for the AR graphics. The touchscreen, also rendered by a Viz Engine, allowed the presenter to move players on an AR soccer pitch in the studio floor. TDN has also been able to monetize the use of AR graphics adding sponsorships during certain segments. “TDN was able to show how AR graphics have matured into a tool that presenters can use to drive a detailed narrative and make it something that is easy to understand and entertaining for their viewers,” says Daniel Nergård, President, Vizrt Americas.